Mangabey is the common name for the various Old World monkeys comprising the genera Lophocebus ( crested mangabeys), Cercocebus (white-eyelid mangabeys), and Rungwecebus (highland mangabey, Rungwecebus kipunji, also known as the kipunji). They belong to the same family (Cercopithecinae) and tribe (Papionini) as macaques, baboons, and mandrills. Mangabeys, which are found only in Africa, include many of the more rare species of monkeys, but nonetheless provide important roles in the ecosystem. Some, such as the highland mangabey (R. kipunji) and black mangabey or gray-cheeked mangabey (L. albigena), provide seed dispersal for plants (Boomershine and Olson 2007; Davis 2002). Mangabeys, which typically consume vegetative matter (fruits, seeds, leaves) and some invertebrates (such as insects), also serve in food chains as the prey of leopards (Panthera pardus) and large birds of prey, such as crowned eagles (Stephanoaetus coronatus) (Boomershine and Olson 2007). Some also provide food indirectly: L. albigena monkeys have been observed peeling the tough skin of the Gambeya lacourtiana fruit and then tossing it on the ground after taking a bite, with these fruits ripening on the ground and providing food to other species. Mangabeys also are used by humans as a source of food. However, excessive hunting pressure and habitat destruction have helped to contribute to threats to various mangabey populations, with many severely limited in population size and areas of inhabited forest. Mangabeys are Old World monkeys (family Cercopithecidae), which, along with apes of the Old World, comprise one of the three major informal groups of the biological order Primates, the other two groups being prosimians and New World monkeys. Old World monkeys typically are characterized by close-set nostrils that are downward or forward facing, a tubular ear bone, and a tail, if present, that is never prehensile (adapted for grasping or holding). The three genera of mangabeys—Lophocebus, Rungwecebus, and Cercocebus—were once thought to be very closely related, so much so that all the species were in one genera. However, it is now understood that Lophocebus and Rungwecebus species are more closely related to the baboons in genus Papio, while the Cercocebus species are more closely related to the mandrill in genus Mandrillus. In 2006, the highland mangabey was moved from Lophocebus to a new genus, Rungwecebus, the first new primate genus in 83 years. The crested mangabeys are West-African Old World monkeys, belonging to the genus Lophocebus. They tend to have dark skin, eyelids that match their facial skin, and crests of hair on their heads. They are closely aligned to baboons (Papio) and have been called baboon-manabeys (Groves 2007). It is believed that they diverged from the baboons and the geladas (Theropithecus) only about four million years ago, in the mid-Pliocene (Groves 2007). Originally, five subspecies were recognized, all placed within L. albigena. However, subsequent analysis led first to the upgrading of L. aterrimus and l. opdenboschi to species rank, and then the recognition of the other three subspecies as diagnosably distinct species; subsequent re-examination of field survey data also lead to the designation of a new species L. ugandae (Groves 2007; Tenywa 2007). Characters on the crest of the crown, cheek whiskers, and pelage in general can be used to recognize the differences in these species. For example, in the color of the mantle of elongated hair over the foreparts, the color in L. osmani is rusty brown, in L. albigena is is light gray (sometimes with faint straw tones), and in L. johnstoni it varies from a dark gray-brown to a very pale, whitish-gray to chocolate (Groves 2007). In L. osmani and L. albigena there is usually a black patch on the nape and withers (with this rare in L. johnstoni), and the underside is yellow-gray in L. osmani but noticeably lighter in L. johnstoni and L. albigena. In osmain the cheek-whiskers are long and bright gray or golden-white, while they are creamier in L. albigena and light gray-brown to white in L. johnstoni. Given the close similarity of these monkeys, a description of the gray-cheeked mangabey (Lophocebus albigena) will help to provide insights on crested mangabeys in general. Gray-cheeked mangabeys have very long, slender, somewhat prehensile tails, which can reach 55 to 100 centimeters in length, while the adults themselves measure between 40 and 72 centimeters in length and between four and 11 kilograms in weight (Davis 2002). They have slight sexual dimorphism with males 15 percent to 30 percent larger than females (Davis 2002). L. albigena is nearly completely arboreal, preferring to inhabit the middle and upper layers of the canopy (Davis 2002). They only come to ground occasionally for feeding, such as to raid cultivated fields (Davis 2002). The majority of time they feed on fruits, with nuts and seeds also prominent in their diet (Davis 2002). Other food sources are flowers, leaves, and insects, as well as cultivated crops such as maize and sweet potatoes. The highland mangabey (Rungwecebus kipunji) is a species of Old World monkey that lives in the highland forests of Tanzania. Also known as the kipunji, it is about three feet long and has long brown fur, which stands in tufts on the sides and top of its head. Its face and eyelids are uniformly black. It has an off-white colored tail (Boomershine and Olson 2007). The highland mangabey is arboreal in its habits. All the males of this mangabey species emit a loud call to coordinate spacing between different groups. 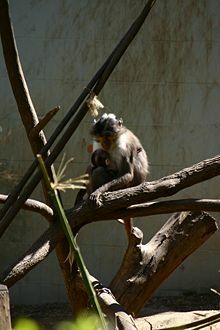 The kipunji has a unique call, described as a "honk-bark," which distinguishes it from its close relatives, the gray-cheeked mangabey and the black crested mangabey, whose calls are described as "whoop-gobbles." It is a social species, traveling in mixed male-female groups estimated at 30 to 36 individuals (Boomershine and Olson 2007). Perhaps fewer than 1,000 of the animals live in the highland Ndundulu Forest Reserve, an unprotected forest adjacent to Udzungwa Mountains National Park, and in a disjunct population 250 miles away on Mount Rungwe and adjacent Kitulo National Park. The forest at Rungwe is highly degraded, and fragmentation of the remaining forest threatens to split that population into three smaller populations. The Ndundulu forest is in better shape, but the population there is smaller. The monkey will likely be classified as a critically endangered species. The highland mangabey was independently discovered by researchers from the Wildlife Conservation Society (WCS), the University of Georgia (UGA), and Conservation International (CI) in December 2003 and July 2004, making it the first new African monkey species discovered since the sun-tailed monkey in 1984 (Trevor et al. 2005). Originally assigned to the genus Lophocebus (Trevor et al. 2005), genetic and morphological tests showed that it is more closely related to the baboons (genus Papio) than to the other mangabeys in the genus Lophocebus and that the genus is diphyletic, meaning that species with differing genealogies have been mistakenly lumped together. Scientists have assigned it to a new genus, Rungwecebus, named after Mount Rungwe, where it is found (Davenport et al. 2006). Rungwecebus is the first new monkey genus to be discovered since Allen's Swamp Monkey in 1923, according to researchers (Than 2006). The white-eyelid mangabeys are West-African Old World monkeys, belonging to the genus Cercocebus. The name Cerocebus is Greek for "tail monkey" (Nguyen 1999). White-eyelid mangabeys are characterized by their bare upper eye-lids, which are lighter than their facial skin coloring, and the uniformly colored hairs of the fur. 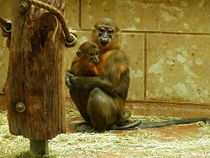 The collared mangabey or red-capped mangabey is both arboreal and terrestrial, but mainly occupy the lower levels of forests (Nguyen 1999). They usually use the trees for food-gathering, hiding, and sleeping, while escaping predators (eagles and leopards) on the ground (Nguyen 1999). As with other mangabeys, they feed on both vegetative material (fruits, nuts, seeds, leaves, etc.) and invertebrates such as insects. Boomershine, L., and L. Olson. 2007. Rungwecebus kipunji Animal Diversity Web. Retrieved June 26, 2008. Davenport, T. R. B., W. T. Stanley, E. J. Sargis, D. W. De Luca, N. E. Mpunga, S. J. Machaga, and L. E. Olson. 2006. A new genus of African monkey, Rungwecebus: Morphology, ecology, and molecular phylogenetics Science, 312: 1378. PMID 16690815. Retrieved June 27, 2008. Davis, S. 2002. Lophocebus albigena Animal Diversity. Retrieved June 26, 2008. ———. 2007. The endemic Uganda mangabey, Lophocebus ugandae, and other members of the albigena-group (Lophocebus) Primate Conservation 22. Retrieved June 27, 2008. Nguyen, K. 1999. Cercocebus torquatus Animal Diversity. Retrieved June 26, 2008. Tenywa, G. 2007. 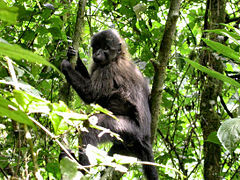 New monkey species in Mabira—expert New Vision, February 16, 2007. Retrieved June 27, 2008. Than, K. 2006. Scientists discover new monkey genus in Africa LiveScience, May 11, 2006. Retrieved June 27, 2008. Trevor, T., C. L. Ehardt, T. M. Butynski, T. R. B. Davenport, N. E. Mpunga, S. J. Machaga, and D. W. de Luca. 2005. The highland mangabey Lopocebus kipunji: A new species of African monkey Science, 308: 1161–1164. PMID 15905399. Retrieved June 27, 2008. This page was last modified on 9 August 2018, at 16:04.